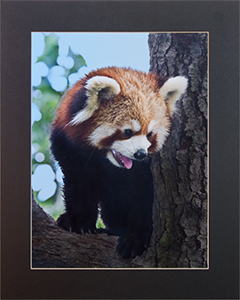 In addition to the giant pandas, this base has other endangered wildlife, including red pandas, swans, peacocks, other birds, and butterflies. While we were there, we even had the opportunity to hold a red panda. Although their diets are similar to the giant panda and they both have “false thumbs”, red pandas are in their own family and share the same superfamily with the weasel, raccoon and skunk families, not at all related to the giant panda. Their bodies are 20 to 25 inches long, with their tail being almost as long. Males are from 8 to almost 14 pounds. Females are slightly smaller. 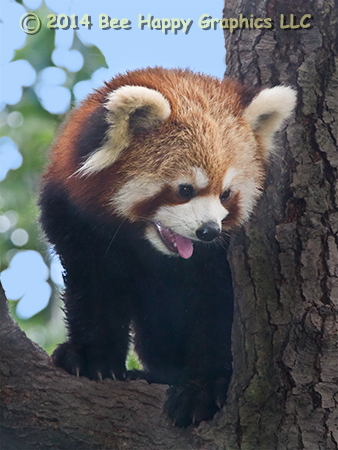 Red pandas are nocturnal and are excellent climbers, spending most of their time foraging or sleeping in trees, alone except during mating season. Although about two-thirds of their diet (about 12 pounds per day) is bamboo (which they don't digest well as it takes about three hours to pass through their digestive tract), they also eat mushrooms, roots, acorns, lichens, and grasses, with occasional fish and insects. Photographic details: Canon EOS 7D camera w/ EF 100-400mm f/4.5-5.6L IS USM lens set at 400mm. Flash was used. Camera was on f/11 for 1/250 sec at ISO 4000. Fine Art Paper 16" x 12" 22" x 16"
Canvas N/A 29" x 22"